Inflatable Dry Slide rentals from Big Lou's Bouncies are truly the centerpiece attraction at any festival or event! The selection of dry slide rentals below are for dry use only, so please click the picture or title below for more information, larger picture, and videos of each bouncer. 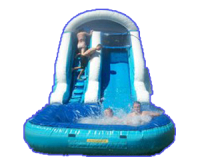 For information on Water Slide rentals that are ready for water use, please check out our water slide page. We are a full service Inflatable party rental company. We will deliver, set up, and pick up each dry slide rental for a hassle free experience! A full day is considered 6-8 hours, and we deliver at least 1 to 5 hours prior, depending on our days schedule. Pick ups are not exact times, we will pick up your inflatable rental 1-5 hours after your event has ended. We call to confirm your Water slide rentals, (dry) and give you a delivery time frame the day before your event. We usually call between 5:30 and 8:30pm the ecening before your event date. Big Lou's Bouncies prides ourselves in large selection, pricing and excellent customer service for each of our inflatable slide clients! We ensure each party rental is a memorable one, and a smooth experience from start to finish. We cary a large range of bounce house rentals, water slide rentals and Dry slides so you have a large variety of choices. Each inflatable is cleaned frequenty to ensure optimal health and safety for you and your guests. Big Lou's Bouncies is also properly insured for a worry-free moonwalk rental experience. We thouroughly train each team member of our staff so set-up and take-down of the bounce house goes smoothly and efficiently! Serving The Tampa Bay Area since 2006. Book online or Call and speak with us today! Big Lou's Bouncies rents Dry Slides, moonwalks, bounce house rentals, water slide rentals and is located in Brandon, Florida. We deliver to many surrounding areas including: Tampa, Riverview, Valrico, Dover, Ruskin, Mango, Lithia, Seffner, Fishhawk, Ruckin, Wimauma, Apollo Beach, South Tampa, Wesley Chapel and more! Depending on distance from our warehouse, Delivery fees may apply in some areas. Give us a call at 813-404-6744 or get a Fast quote online to start your party rental experience!